Intermittent ash explosions during the last century have characterized activity at Japan's Kuchinoerabujima volcano, located at the northern end of the Ryukyu Islands approximately 260 km S of Nagasaki, Japan. Brief periods of higher seismicity had been detected in the last approximately 30 years, although no explosions had been recorded since 1980 (BGVN 35:11 and 38:01). A new explosion occurred on 3 August 2014, and activity remained elevated through June 2015. Information on the latest activity is provided by the Japan Meteorological Agency (JMA) monthly reports and aviation alerts are from the Tokyo Volcanic Ash Advisory Center (VAAC). A modest explosion from Shindake crater on 3 August 2014 caused JMA to increase the Alert Level at the volcano. Activity decreased shortly after the explosion, and only steam plumes, fumarolic activity, and occasional incandescence were observed for the next nine months. A large explosion on 29 May 2015 generated a gray-black ash plume that rose to over 9 km altitude and sent pyroclastic flows down the flanks; JMA increased the Alert Level and ordered evacuation of local residents. Activity declined after a few days, and Shindake remained quiet until a smaller explosion on 18 June 2015. The ash plume did not exceed 1 km, but ashfall was reported in towns on neighboring islands and in areas up to 80 km E. Two additional smaller explosions were reported on 18 and 19 June. Seismicity decreased significantly after the 19 June explosion, but SO2 emissions remained elevated until October 2015. The JMA did not lower the Alert Level until June 2016. Activity during August 2014-February 2015. JMA reported an eruption from the vicinity of Shindake crater around noon local time on 3 August 2014, with a gray plume rising more than 800 m above the crater rim. This led to an increase in the Alert Level from 1 (Normal) to 3 (Do not approach the volcano) on a 5-level scale. An overflight confirmed traces of ash on the W flank. The Tokyo VAAC reported that the plume rose to an altitude greater than 1.5 km and drifted N. On 5 August, seismicity decreased, and views from a remote web camera showed a white plume rising 50 m above the crater rim. For the rest of August, seismicity remained low and steam plumes rose 50 to 800 m above the crater. During September 2014, white plumes were generally observed 200-800 m above the crater when visibility was not obscured by weather; seismicity remained low. Scientists conducting a field survey on 12 September found SO2 emissions at 300 metric tons per day (t/d), higher than the background value of 60 t/d measured on 21 May 2014. Occasional earthquakes were recorded in October 2014, and the volume of gas emissions remained relatively high compared with before the August eruption; steam-and-gas plumes rose to 600 m above the crater rim. During field surveys on 7 and 8 October scientists measured SO2 emissions of 500 t/d. Gas emissions rose from within the Shindake crater, around a thermally anomalous fissure at the W edge of the crater, as well as from a new fumarole on the SW flank of the crater. In November, plumes continued to rise as high as 1,000 m above the crater. In another survey on 9 December 2014, scientists found that SO2 levels had increased to 1,700 t/d. Emissions of SO2 remained high during the second half of January 2015, ranging from 1,100 to 3,100 t/d. 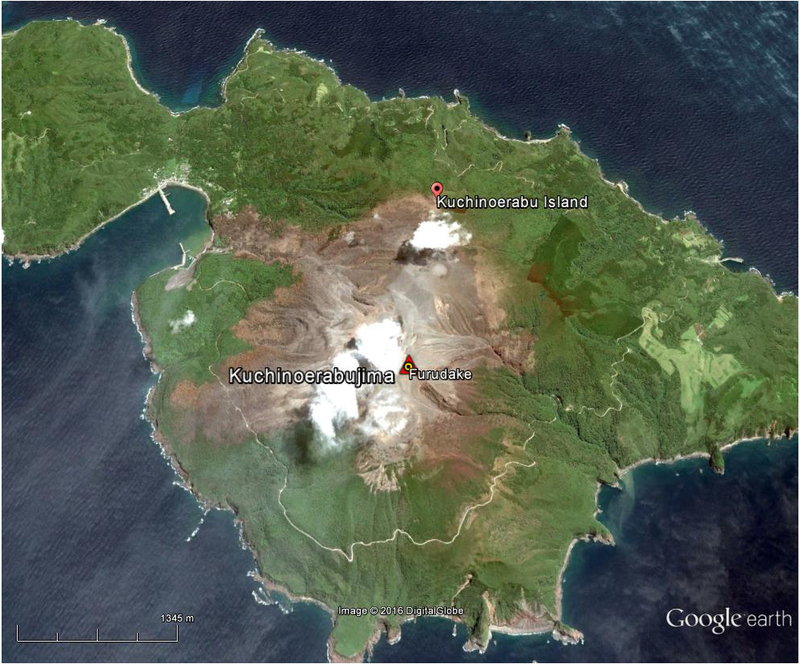 A M 2.2 seismic event located 5 km beneath the island was recorded on 24 January. Observations made during field surveys in February confirmed continued steam emissions, and thermal anomalies from the W crater rim fissure and the new fissure on the SW flank. SO2 emissions decreased slightly from January levels to a range of 400 to 2,700 t/d in February, and steam plumes continued to rise 400-700 m above the crater. Activity during March-June 2015. Incandescence at night was first recorded at the Shindake Crater from 24 to 31 March 2015 with a high-sensitivity camera. Aerial observation on 25 March by JMA and JCG (Japan Coast Guard) indicated a temperature rise and continued fumarolic activity around the thermal anomaly W of the crater rim. SO2 emissions remained high in March (1,000 to 3,700 t/d) and April (900 to 2,600 t/d), and steam plumes rose to 1 km above the crater. Incandescence was occasionally observed at night during April and again during 18-22 May; fumarolic activity continued along with a rise in temperature at the W and SW fissures. Steam plumes were observed rising to 600 m above the crater in May. According to JMA, at 0959 local time on 29 May 2015, a large explosive phreatomagmatic eruption generated a gray-black ash plume that rose to over 9 km altitude and drifted ESE (figure 5). The plume was reported by the Tokyo VAAC to be at 10.9 km altitude about an hour after the eruption. The largest of several pyroclastic flows descended NW from the SW side of the crater in the Mukaehama district and reached the coast. Based on these events, JMA raised the Volcanic Alert Level to 5 (Evacuate). Aerial observation conducted on the same day (in collaboration with the Kyushu Regional Bureau of the Ministry of Land, Infrastructure, Transport and Tourism) revealed additional pyroclastic flows moving in nearly all directions from the Shindake crater (figure 6) including flows reaching halfway down the mountain to the SW and SE of the crater. Seismicity increased immediately after the eruption, but had decreased by midday. Figure 5. Ash plume from Kuchinoerabujima's Shindake Crater during an explosion on 29 May 2015. The plume height was reported by the Tokyo VAAC as 10.9 km altitude. Photo taken from the neighboring island of Yakushima by Itaru Takaku. Courtesy of Kyodo News and The Japan Times. Figure 6. Google Earth imagery dated 5 June 2015, one week after a large explosion which generated several pyroclastic flows around the summit crater at Kuchinoerabujima. Note the brown areas extending in most directions away from the summit crater (beneath the white clouds), all the way to the coast on the NW and W flanks that are the result of the pyroclastic flows that occurred on 29 May 2015. Courtesy of Google Earth. According to a news article (The Japan Times), all residents and visitors (141 people) were safely evacuated by a ferry, coast guard ship, and helicopter to neighboring Yakushima Island (25 km SE). 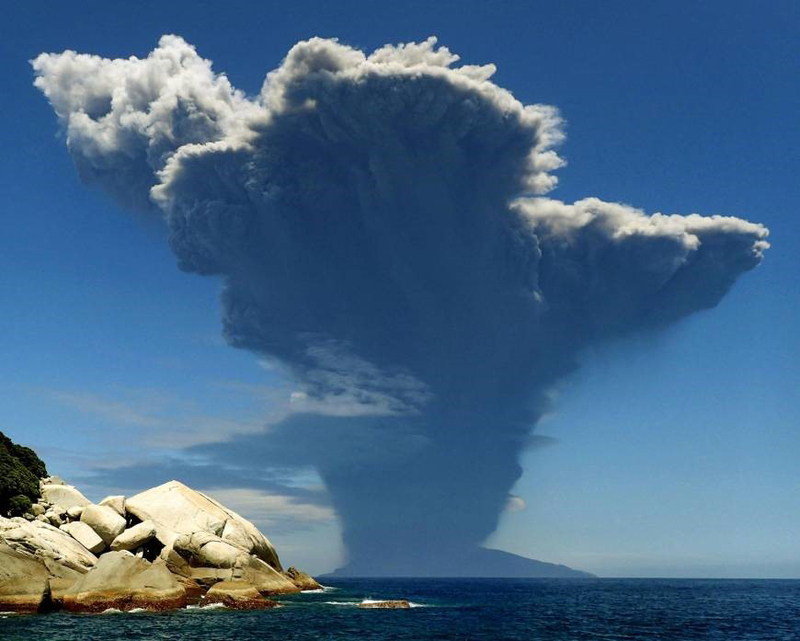 A resident of Yakushima reported that ash reached the island. Later that day, ash plumes rose 200 m and drifted SW.
Ash plumes continued the next day, 30 May, rising only 1.2 km. A field team observed discolored trees on the SE and SW flanks, and fallen trees near the coast on the NW flank. Cloud cover prevented views of the eruption area, but the team was able to confirm continued fumarolic activity and incandescence in the W part of the crater. Seismicity continued at low levels, and during the first week of June white plumes rose 100-400 m above the crater rim. Another smaller eruption on 18 June 2015 caused lapilli and ash to fall on the E side of the island. Ash was reported in Yakushima Town (44 km ESE on Yakushima Island), Nishinoomote City (80 km NE on Tanegashima Island), and Nakatane Town (72 km E on Tanegashima). Small eruptions also occurred at 1631 on 18 June and at 0943 on 19 June. Tokyo VAAC reported the larger 18 June eruption, but plume heights were below 1 km, and not observed on satellite. Aerial observations on 20 June by JMA revealed no traces of new pyroclastic-flow deposits around the crater or on the flanks. Post-eruption observations through June 2016. Emissions of SO2 remained elevated during June 2015 (800-1,700 t/d), and decreased somewhat in July to 500-700 t/d. They decreased further to 200-300 t/d in August. Increased seismicity was recorded briefly from 1-3 and 6-11 August. SO2 emissions continued to decline in September, except for a spike of 700 t/d on 10 September. Thermal infrared observations taken during a field survey in October 2015 indicated a decrease in temperature around the fissure W of the crater rim since the 29 May eruption. Emissions of SO2 remained below 300 t/d for the remainder of 2015 and no further activity was reported, although the Alert Level remained at 5. On 14 June 2016, JMA lowered the Alert Level to 3; seismic activity and SO2 flux values were below levels detected prior to the May-June 2015 eruption. Information Contacts: Japan Meteorological Agency (JMA), Otemachi, 1-3-4, Chiyoda-ku Tokyo 100-8122, Japan (URL: http://www.jma.go.jp/); Tokyo Volcanic Ash Advisory Center (VAAC), 1-3-4 Otemachi, Chiyoda-ku, Tokyo, Japan (URL: http://ds.data.jma.go.jp/svd/vaac/data/); Google Earth (URL: https://www.google.com/earth/); The Japan Times (URL: http://www.japantimes.co.jp/news/2015/05/29/national/volcano-erupts-isle-kagoshima-prompting-evacuation-order/). JMA reported that at 1637 on 18 December an eruption at Kuchinoerabujima’s Shindake Crater produced an ash plume that rose 2 km and then disappeared into a weather cloud. The event ejected material that fell in the crater area, and generated a pyroclastic flow that traveled 1 km W. The Alert Level remained at 3 (on a scale of 1-5). JMA reported that during 28 November-3 December intermittent events at Kuchinoerabujima’s Shindake Crater generated plumes that rose as high as 1.5 km above the crater rim. The Alert Level remained at 3 (on a scale of 1-5). JMA reported that during 22-26 November intermittent events at Kuchinoerabujima’s Shindake Crater generated plumes that rose as high as 2.1 km above the crater rim. The Alert Level remained at 3 (on a scale of 1-5). JMA reported that during 31 October-5 November there were very small events recorded at Kuchinoerabujima’s Shindake Crater. Plumes rose 500-1,200 m above the crater rim. The Alert Level remained at 3 (on a scale of 1-5). Based on satellite images and information from JMA, the Tokyo VAAC reported that during 24-28 October ash plumes from Kuchinoerabujima’s Shindake Crater rose to altitudes of 0.9-1.5 km (3,000-5,000 ft) a.s.l. and drifted in multiple directions. JMA scientists noted no changes in the thermal anomalies at the crater during a field observation on 28 October. The Alert Level remained at 3 (on a scale of 1-5). JMA reported that earthquakes at Kuchinoerabujima’s Shindake Crater typically occur at shallow levels, though on 15 August a swarm of deep volcanic earthquakes was recorded, prompting JMA to raise the Alert Level to 4 (on a scale of 1-5). The earthquake hypocenters were about 5 km deep, below the SW flanks of Shindake, and the maximum magnitude was 1.9. They occurred at about the same place as the swarm that occurred just before the May 2015 eruption. Sulfur dioxide emissions had been increasing since the beginning of August; they were 1,600, 1,000, and 1,200 tons/day on 11, 13, and 17 August, respectively. No surficial changes in gas emissions or thermal areas were observed during 16-20 August. JMA reported that a low-temperature thermal anomaly persisted near the W fracture in Kuchinoerabujima Shindake crater. In addition, both the number of volcanic earthquakes (generally occurring in a large quantity) and sulfur dioxide flux remained above baselines levels in August 2014. No eruptions have occurred since 19 June 2015, and deflation had been recorded since January 2016; the Alert Level was lowered to 2 (on a scale of 1-5). JMA reported that during 3-8 June white plumes rose 100-400 m above Shindake Crater's rim at Kuchinoerabujima. Volcanic earthquakes had declined on 30 May but continued to periodically occur. The Alert Level remained at 5 (the highest level on a 1-5 scale). JMA reported that at 0959 on 29 May an explosive and phreatomagmatic eruption at Kuchinoerabujima generated an ash plume that rose 9 km above Shindake Crater's rim and drifted ESE. Pyroclastic flows descended the SW flank and reached the coast on the NW flank. Volcanic earthquakes increased after that event, but then decreased around 1300. The Alert Level was raised to 5 (the highest level on a 1-5 scale). According to a news article all residents and visitors (137-141) were safely evacuated by a ferry to neighboring Yakushima Island. Later that day ash plumes rose 200 m and drifted SW. Scientists conducted an overflight and confirmed pyroclastic flow deposits on the NW and NE flanks. Ash plumes continued to be emitted the next day, rising as high as 1.2 km. A field team observed discolored trees on the SE and SW flanks, and fallen trees near the coast on the NW flank. Cloud cover prevented views of the eruption area, but the team was able to confirm continued fumarolic activity from a crack in the W part of the crater as well as incandescence. JMA reported that no eruptions occurred from Kuchinoerabujima during 16-20 February, although the level of activity remained elevated. White plumes rose 600 m above the crater. Low-level seismicity continued and tremor was absent. The Alert Level remained at 3 (on a scale of 1-5). JMA reported that no eruptions occurred from Kuchinoerabujima during 9-16 February although the level of activity remained elevated. White plumes rose 400-700 m above the crater. Low-level seismicity continued and tremor was absent. Scientists aboard an overflight on 10 February observed a new crater with high-temperature areas on the NE part, new fissures, and white steam emissions. The Alert Level remained at 3 (on a scale of 1-5). JMA reported that no eruptions occurred from Kuchinoerabujima during 5-9 January, although the level of activity remained elevated. White plumes rose 500 m above the crater. Low-level seismicity continued and tremor was absent. The Alert Level remained at 3 (on a scale of 1-5). JMA reported that no eruptions occurred from Kuchinoerabujima during 8-12 December, although the level of activity remained elevated. White plumes rose 400 m above the crater. Low-level seismicity continued and tremor was absent. Sulfur dioxide emissions increased on 9 December; measurements indicated a rate of 1,700 tons per day. The Alert Level remained at 3 (on a scale of 1-5). JMA reported that no eruptions occurred from Kuchinoerabujima during 1-5 December, although the level of activity remained elevated. White plumes rose 300 m above the crater. Low-level seismicity continued and tremor was absent. The Alert Level remained at 3 (on a scale of 1-5). JMA reported that no eruptions occurred from Kuchinoerabujima during 25-28 November although the level of activity remained elevated. White plumes rose 200 m above the crater. Low-level seismicity continued and tremor was absent. The Alert Level remained at 3 (on a scale of 1-5). JMA reported that no eruptions occurred from Kuchinoerabujima during 29 September-3 October. White plumes rose 600 m above the crater. Low-level seismicity continued and tremor was absent. The Alert Level remained at 3 (on a scale of 1-5). JMA reported that no eruptions occurred from Kuchinoerabujima during 26-29 September. White plumes rose 300 m above the crater. Low-level seismicity continued and tremor was absent. The Alert Level remained at 3 (on a scale of 1-5). During 8-16 September JMA reported that Alert Level 3 conditions persisted at Kuchinoerabujima, but no eruptive activity was observed. Low-level seismicity continued and tremor was absent. White plumes were visible on webcamera images rising 800 m from the crater during 8-12 September and to 600 m during 13-16 September. A field survey on 12 September measured SO2 emissions that were similar to pre-eruptive levels (300 tons/day). JMA reported that during 27 August-2 September few volcanic earthquakes were accompanied by no explosion at Kuchinoerabujima. On most days a white plume rose 50-300m above the crater rim . The Alert Level for Kuchinoerabujima remained at 3 (on a scale of 1-5). JMA reported on 6, 12 August a white plume rose 800m and 300 m respectively above the crater rim at Kuchinoerabujima. Views of the volcano remained obscured by clouds other days, but instruments recorded volcanic seismicity and volcanic tremor. The Alert Level for Kuchinoerabujima remained at 3 (on a scale of 1-5). On 27 October, JMA raised the Alert Level for Kuchinoerabu-jima from 2 to 3 (on a scale of 1-5). GPS measurements indicated that inflation just below the summit crater, which had started in September, was continuing. Fumarolic activity near summit had also increased. On 4 September, JMA had raised the Alert Level for from 1 to 2 because of the increased seismicity. After four years of quiet, a brief, weak explosion produced a [2-3-km-high] ash cloud on 28 September at 0510. Ash fell on the sea [SW] of the volcano, missing the homes of the 12 x 5 km island's 300 residents. Activity after the explosion was limited to emission of white vapor through the end of September. Minor ash explosions have occurred in seven different years since 1966. "After the 28 September eruption, which lasted for 1/2 hour, no additional eruptions had occurred as of the end of December. Eight scientists from Kyoto University, Kagoshima University, and the JMA observatory arrived at the island on 1 October, installing portable seismometers at five sites. The next day, they climbed to the new fissure, which was 0.6-6.0 m wide and 750 m long, trending N-S near Shin-dake crater (figure 1), active in historic time. A considerable amount of white vapor was emitted from the fissure. Figure 1. Sketch map of Kuchinoerabu-jima Island, 28 September 1980. Ashfall isopachs are in centimeters. Blocks fell in the stippled area. Shaded zones are inhabited. Courtesy of JMA. "The SW sector of the volcano was covered with gray ash, l m thick near the fissure and 2 cm thick at the base of the volcano, on the coast. Blocks were scattered N and W of the fissure, the largest block measuring about 2 m in diameter. No essential ejecta were observed. The volume of ejecta was estimated at about 105 m3. Steaming decreased gradually during October, and was restricted to 10 small craters on the fissure by mid-October. "Seismicity was relatively weak in October and November except on 4 and 9 October when swarms of small B-type earthquakes were recorded (figure 2). The JMA's seismometer was removed on 15 November because the volcano was quiet. People on the island reported no felt earthquakes, and decreasing steam activity through December. Life returned to normal for the island's 300 inhabitants soon after the 28 September eruption." Figure 2. Number of seismic events/day at Kuchinoerabu-jima, 1 October-15 November 1980. Courtesy of JMA. Seismicity has been increasing since January 1996. According to the Sakura-jima Volcanological Observatory, Kyoto University, 75 and 25 earthquakes were detected around Shin-dake cone in June and July, respectively. Seismicity has been increasing since January 1996 (BGVN 21:04, 21:05, and 21:07). According to the Sakura-jima Volcanological Observatory, Kyoto University, 62 earthquakes were detected around Shin-dake cone during August. The Japan Meteorological Agency (JMA) reported an increase in seismic activity on Kuchinoerabu-jima since July 1999 based on data from Sakura-jima Volcano Observatory (SVO), Kyoto University. The number of earthquakes/month increased, rising from 26 in June, to 87 in July, and to 195 in August. By mid-September, JMA and SVO had not observed any anomalous change in fumaroles in the craters of Shin-dake (the youngest volcanic cone). Kuchinoerabu-jima is a volcanic island 12 km long and 5 km wide located ~100 km SSW of southern Kyushu Island and Sakura-jima volcano. An andesite stratovolcano, Kuchinoerabu-jima includes both an older edifice to the NW and young edifices (Furudake and Shindake cones) to the SE. Historical eruptions at Shindake were phreatic. An eruption in December 1933 killed 8 persons and injured 26. Information Contacts: Volcanological Division, Seismological and Volcanological Department, Japan Meteorological Agency (JMA), 1-3-4 Ote-machi, Chiyoda-ku, Tokyo 100 Japan; Setsuya Nakada, Volcano Research Center, ERI, University of Tokyo, Yayoi 1-1-1, Bunkyo-ku, Tokyo 113, Japan (URL: http://www.eri.u-tokyo.ac.jp/VRC/index_E.html). No eruptive activity has been reported at Kuchinoerabu-jima since a small eruption in September 1980 (SEAN 05:12). However, there have been many periods of elevated seismicity. One such episode, beginning in early September 2008, prompted two increases in the hazard status by late October when the seismicity was accompanied by inflation and increased fumarolic activity near the summit (BGVN 33:09). The Alert Level remained at 3 (on a scale of 1-5) until 18 March 2009, when it was decreased to level 2. Sulfur dioxide emissions had decreased in January 2009, followed by a decrease in the rate of deformation. Seismicity data during 2003-2009. Seismic data recorded by JMA between January 2003 and December 2006 indicted that the number of monthly volcanic earthquakes was typically below 200, with less than 30 tremor events. Seismicity was higher in March 2004, January-February, May, July-September, and November 2005, March-April, August, and October-December 2006, and February and April 2007 (table 1). Table 1. Months with anomalous seismicity at Kuchinoerabu-jima between January 2003 and December 2009, showing numbers of earthquakes, tremors, and plume observations. Months with either more than 200 volcanic earthquakes or more than 30 tremors are shown, and months with earthquake swarms on specific days. All observed plumes throughout this period were white. Data courtesy of JMA. Sep 2009 177 6 10 200 Earthquakes: 75 on 27 Sep, ~750 on 28-29 Sep. Tremors on 28 and 30 Sep.
Oct 2009 131 32 10 200 All tremors during 1-6 Oct.
A seismic swarm consisting of 70 events on 4 September 2008 resulted in the Alert Level increase already reported. The months of September-December 2008 included high numbers of tremor episodes (table 1). Large numbers of tremors were recorded again in April-May 2009. Seismicity decreased after that time, until an earthquake swarm was recorded during 27-29 September 2009 (about 150 earthquakes). Tremor events also increased briefly, with 38 between 28 September and 6 October 2009. White fumarolic plumes rising from the summit area increased in height (up to 400 m) and frequency (every 1-2 days) after September 2008 through 2009. Since a small eruption in 1980, Kuchinoerabu-jima experienced numerous periods of elevated seismicity, with volcanic earthquakes and tremor detected at least through December 2009 (BGVN 35:11). The volcano is located in the Ryukyu Island arc, off Japan's SW coast (figure 4). Figure 4. A map of the major volcanoes of Japan. Kuchinoerabu-jima is at the lower left. Courtesy of USGS/CVO. Recent monthly reports of volcanic activity from the Japan Meteorological Agency (JMA) translated into English resumed in October 2010. The only recent English-translated JMA report on Kuchinoerabu-jima available online through December 2012 was in January 2012. We know of no other recent report on this volcano's seismic activity; therefore, this report summarizes seismicity between December 2011 and January 2012. According to JMA, seismicity increased to a relatively high level immediately after 11 December 2011, but then decreased on 5 January 2012. On 20 January 2012, the Alert Level was lowered from 2 to 1; JMA noted that the possibility of an eruption was minimal. During the December 2011-January 2012 period, no significant change in plume activity was observed, and plume heights remained below 100 m above the crater. According to a field survey on 11 January, infrared images (compared to images obtained in December 2011) showed no significant change in temperature distribution either at the summit or on the W slope of Shin-dake (also refered to as Shin-take), the youngest and most active cone. Field surveys found that sulfur dioxide levels were 50 and 100 metric tons/day on 12 and 13 January 2012, respectively, which were lower than those recorded in December 2011 (200 metric tons/day on 9 December 2011). According to JMA, continuous GPS measurements have established a baseline across Shin-dake, collecting data since September 2010. Shin-dake's rate of change in surface deformation at the stations has been slowing since September 2011. Geshi N, Kobayashi T, 2006. Volcanic activities of Kuchinoerabujima volcano within the last 30,000 years. Bull Volc Soc Japan (Kazan), 51: 1-20 (in Japanese with English abs). There is no Deformation History data available for Kuchinoerabujima. 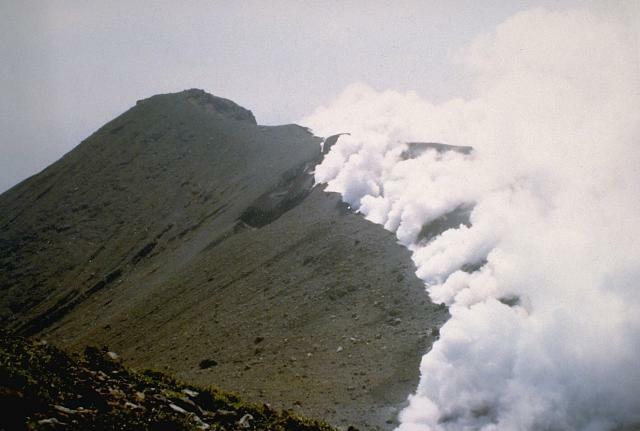 Steam plumes pour from a newly opened arcuate fissure on Shin-dake, the summit crater of Japan's Kuchinoerabu volcano, on September 29, 1980. A brief eruption from the new 800-m-long fissure the day before ejected blocks and ash up to 2 km above the crater. A group of young stratovolcanoes forms the eastern end of the island of Kuchinoerabu-jima in the Ryukyu Islands. All historical eruptions have occurred from Shin-dake, which has had frequent explosive eruptions since 1840 that have sometimes damaged villages located near the crater. Photo courtesy of Japan Meteorological Agency, 1980. 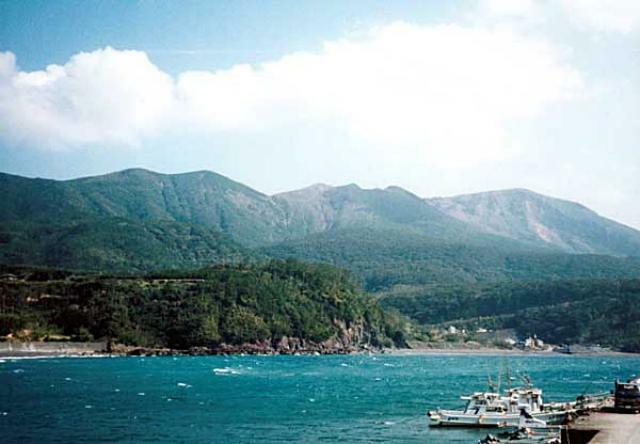 Kuchinoerabu volcano rises to the SE above the fishing village of Motomura. The active cone of Shin-dake is in the center, Sankakuten-yama at the left, and Furu-dake (Huru-dake), the 649 m high point of the island, at the right. Shin-dake was formed after the NW side of Furu-dake was breached by an explosion and has been the site of frequent explosive eruptions in historical time. Several villages on the 4 x 12 km island are located within a few kilometers of Shin-dake and have suffered damage from eruptions. There are no samples for Kuchinoerabujima in the Smithsonian's NMNH Department of Mineral Sciences Rock and Ore collection. Large Eruptions of Kuchinoerabujima Information about large Quaternary eruptions (VEI >= 4) is cataloged in the Large Magnitude Explosive Volcanic Eruptions (LaMEVE) database of the Volcano Global Risk Identification and Analysis Project (VOGRIPA).